Surprise your loved ones, friends, relatives or employees with a tour voucher from CROSSTOURS! Choose one of our planned tours with a guide that always stands by your side, not only, but especially if it is your first time on a Segway! The times are guideline values inclusive training. If you want to stop in any café or any of the numerous snack bars, just let us know when booking! For special requests, special tours (departure at your home or from your company), pick-up service etc. simply contact us! Each voucher is delivered with our folder flyer, a business card and a beautiful satin-finished gift envelope. VOUCHER VALID FOR ALL OUR OFFERED TRACKS AND TOURS! Surprise your loved ones, friends, relatives or employees with a CROSSTOURS value voucher! 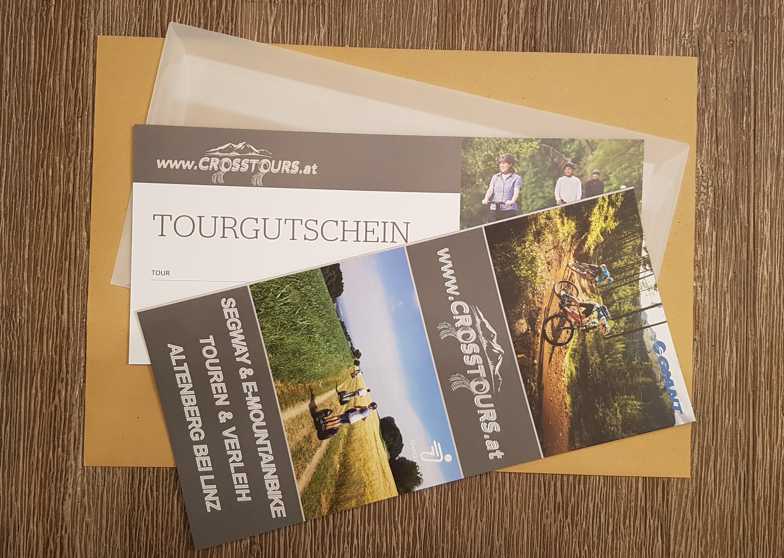 With the voucher, the lucky one can book a Segway or an e-mountainbike, a tour or anything from our shop. For special wishes, tours etc. simply contact us! VOUCHER VALID FOR ALL OUR TOURS, RENTAL EQUIPMENT & OF COURSE IN THE OUR ONLINE SHOP!